Most recent photos are here, at the top. To see more photos, be sure to follow us on instagram, where we post more than anywhere else! Also, head over to our NEW page to check out our not yet seen “yardie” photos and read a bit more about some of the people who are contributing their time and skills here at the Astillero Verde. Sourcing 'Cedro Amargo' (Spanish Cedar) for our frames & deckbeams. These trees were planted 50 years ago in a cow-field by a farmer to bring a more sustainable source of income in for their family. These secondary-growth trees were selectively cut, with environmental permits. Location: Cocoroca, Punta Morales. Shipyard. Unloading river rocks to build up the foundation of where CEIBA's keel will be laid. Seeking naturally wind-fallen hardwoods within the Cloud Forest. Measuring & marking up a piece of 'Tamarindo del Monte' (ironwood) before sawing with the Alaskan Mill. 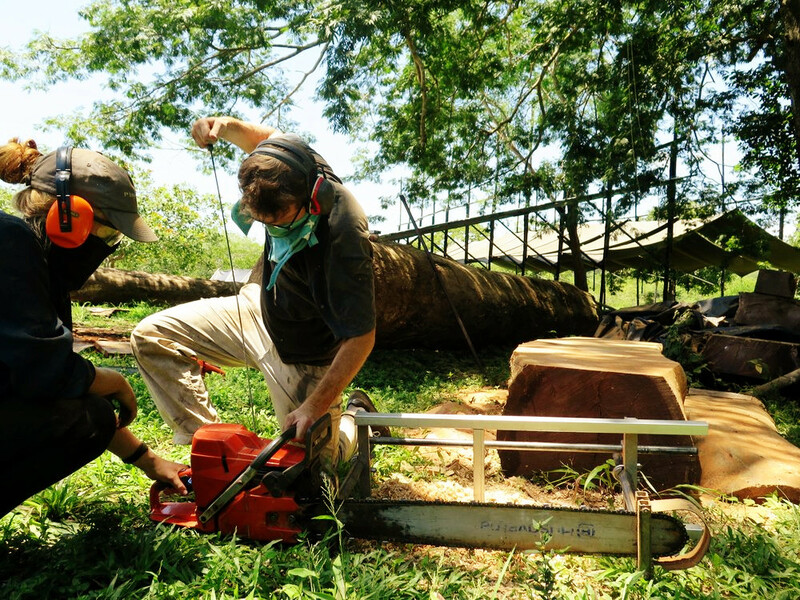 Milling the 'Cedro Amargo' (Spanish Cedar) with the Costa Rican sawyers / lumberjacks. Teamwork during a weekend workshop. Permaculture (and other) skills are taught by guest instructors. This particular weekend was making an aquatic water filtration system, using plants to purify grey-water. Working with the neighborhood tractor to lift the new sliding table saw out of the truck. Lesson on how to cut a line with the big chainsaw. Richard works with the pick-ax to break apart the hard, dense clay around the foundation of where CEIBA's keel will be laid. Iris removes the guider nails after the first pass with the Alaskan Sawmill. Shani learns how to run the Alaskan Sawmill from project co-founder Lynx Guimond. Spanish Cedar scattered across the shipyard woodlot, waiting to be cut on the sawmill. Up in the clouds, Lynx branches a Cypress (Cípres) that the team dropped. This softwood will become the weather deck of CEIBA, and the complete shipbuilding hangar. The boys take a break after completing a very wide cut with the Alaskan Sawmill. Gero carries a plank of Cypress (Cípres) that he milled from a standing tree. Gero participated in our three-month apprenticeship, learning all the steps from cutting down a tree to designing & constructing our treehouse-office, lead by Lynx. Lynx measures the width of this large Spanish Cedar. These pieces are destines to become the frames & deckbeams of CEIBA. Our team visiting the site where our Spanish Cedars (Cedro Amargo) were sourced. From Left: Paolo, Danielle, Yannick, Ville, Gero, Lynx & Natassia. Our treehouse-office! Equipped with tables + chairs, lights + power charging stations and wifi, this is the perfect location for getting work done and holding meetings. Made of donated Cypress trees, our crew was able to install the entire platformss in just two weekends. Covering the milled frames pieces (called futtocks) to protect against sun and rain. Spanish Cedar is a very stable wood, not prone to twisting or checking when drying. Belinda and Paolo mill a ''mystery hardwood'' in the Butterfly Gardens. This tree was standing, dead, and needed to be removed as it posed a threat of falling. It is very difficult to identify trees on the mountaintop if they no longer have leaves. Even the local tree specialists couldn't say for sure... we just know it's very very dense! The neighborhood tractor at the yard, re-stacking the sawn timbers. 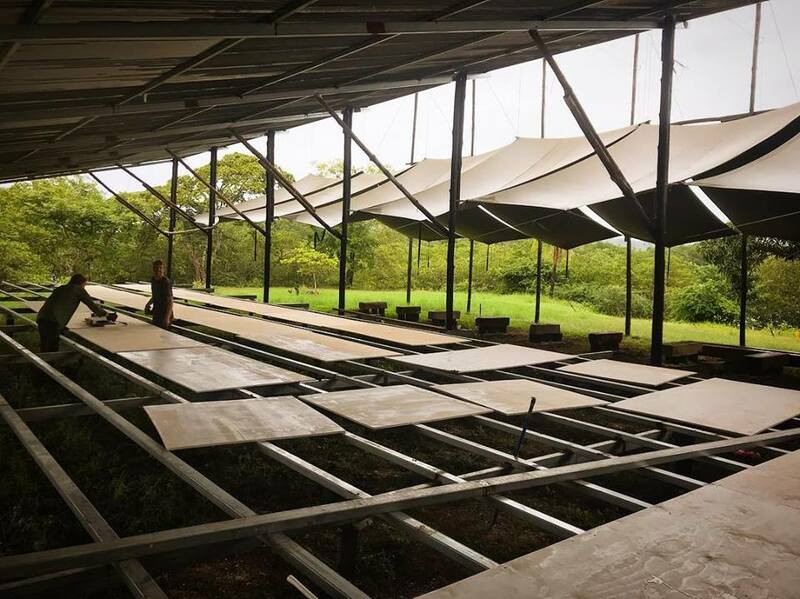 These large pieces will soon become deckbeams of CEIBA. The neighborhood tractor at the yard, re-stacking the sawn timbers. These large pieces will soon become deckbeams of CEIBA. You can see the massive dimensions. The neighborhood tractor at the yard, re-stacking the sawn timbers. 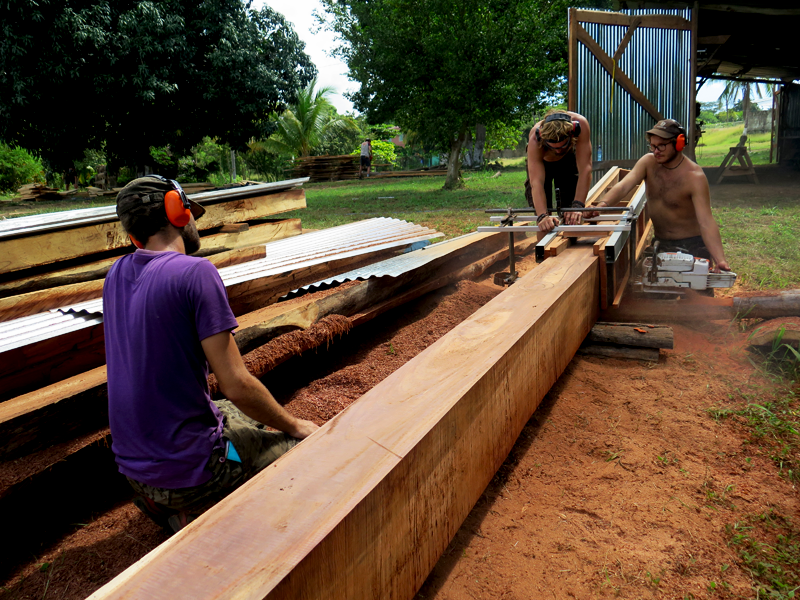 These large pieces will soon become deckbeams and frames of CEIBA. This project is funded entirely by people like you investing in shares.